Comment In the battle for the software-defined data centre, one of VMware's challenges is how to deliver software-defined/controlled storage without screwing up parent EMC's hardware-based storage revenues. VMware is an overall EMC Federation member along with Pivotal and the EMC Information Infrastructure (EMC II) unit. The three are allowed to compete, but what will EMC's chairman and overall CEO Joe Tucci say if one federation member screws up another's revenues and strategy? Will a horse's head be prepared for the misbehaving federation member's CEO? EMC revenues are largely based on hardware storage arrays with software over-pinnings and connective products. VMware revenues are based on server virtualisation software with growing seedlings for software-defined networking (NSX) and storage (VSAN). But VMware has now made it official - it is in the converged appliance business with the EVO range announced at VMworld. As Vulture South predicted, it is an SME product with allof VMware's core goodies - and VSAN - bundled into a rapidly-deployable bundle. EVO:RAIL, the first product to be released, includes vCloud Hybrid Service packaged up with a hardware reference architecture to provide an Infrastructure-as-a-Service (IaaS) appliance so VMware resellers can build the beasts. It's a turnkey, virtualised server SAN with virtualised server compute and software-defined virtualised networking, as well as a scale-out design to allow node multiplication. Okay, now for the big question: will anyone buying this buy a storage array? Not unless it is kept way down market below EMC's VNX radar screen and EMC can play in the high ground with ScaleIO. But if EVO:RAIL is a miniature system for small customers then Nutanix, Simplivity and the rest of the hyper-converged startup cohort will be laughing like drains, milking VMware's validation of their systems for all its worth, and pushing their channel to sell their performance-beating kit instead of the crippled VMware offering. If EVO:RAIL is really an SME product – that is, targeted at small-to-medium enterprise, meaning up to a 5,000 employee enterprise, then EMC's array reps and channel will be pissed, because VMware shops will tend to munch EVO systems instead of EMC II's more expensive. we assume, arrays. And then EMC II CEO David Goulden will get mad and declare internal war on VMware CEO Pat Gelsinger; there will be a storage civil war which Tucci will have to sort out. In my view VMware's DNA is such that hardware suppliers are bound to suffer. To VMware, a server is just a VM-running box; who cares who sells it, and who cares whether competition destroys the seller's margins? Certainly not VMware. So too, to VMware, a storage resource is just a VM data store … get the idea? To VMware it’s software-controlled/abstracted just like a server - and if storage hardware competition to provide the VMware storage resource kills margins why should VMware care? It all contains VMware DNA, right? 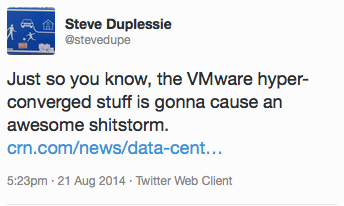 ESG founder Steve Duplessie's tweet on VMware's hyper-converged stuff. 2. A blog from VMware SAS business unit chief strategist Chuck Hollis, called "Making the case for software-defined storage". I read this as the VMware equivalent of a description for the reason why EMC's ViPR software-defined storage product is needed - by VMware. Hey, maybe Amitabh Srivastava, the deposed and promoted head of EMC II's Advanced Software Division, which built ViPR, should go work for Pat Gelsinger? Just kidding. But there's no kidding about the importance of VMware getting its software-defined storage inside its software-defined data centre strategy and product right. A shitstorm of epic proportions outside the EMC federation would be great - for EMC. A shitstorm inside the EMC federation would see one of the two G-men go amidst gigantic ructions.